Though he came of age in another lifetime, Doc Pomus surely would’ve found a kindred spirit in Jay-Z. On the surface they’d seem to have little in common, Pomus was a squat rumpled Jew crippled by polio that had him on crutches while still a boy and in a wheelchair most of his adult life, a gambler often without two nickels to rub together. Jay-Z is a tall elegant African-American with the most glamorous wife on the planet and a music empire to his name. Yet there are similarities as well. Both came into the world under different names – Jerome Felder and Shawn Carter – both rose to fame by virtue of their writing skills, indeed perhaps each were the best songwriters in rock for a brief but notable time, and they both knew first hand the gritty streets of New York at the hustler’s level before making it big. Pomus, who died in 1991, sadly missed out on the music of Jay-Z by just a few years, but had he been around it’s a good bet he’d have smiled at the lyrics to Hard Knock Life, for in some ways they described the existence of Pomus himself. As we’ve already covered in his first review, Doc Pomus was somebody who seemingly had every obstacle imaginable in life thrown at him and somehow overcame them all to leave a sizable legacy behind him as a writer of some of rock’s most iconic songs. But that wasn’t his initial goal exactly and even though at this stage of his life, with a recording contract with Savoy Records proudly in hand getting him closer to fulfilling his dreams than most ever got, he was learning firsthand how difficult the road to success in music was going to be. For those of you too old or uninterested in rock’s most revolutionary style in its entire history to make the connection without crib notes, the heading of this section is the kick-off line for the heft of Jay-Z’s 1998 classic, Hard Knock Life (a song we should be reviewing here on Spontaneous Lunacy if all goes as scheduled on approximately July 23, 2052, give or take a day in either direction). It’s also a pretty good description of Pomus back in the 1940’s. He was perhaps the original cat standing (with the aid of crutches) on the corner, boppin’, looking for something to come his way. Like his historical descendant Carter, both were at a point where their hopes and dreams just to be treated with respect by the outside world, let alone become musical kingpins, were barely worth the sleep required to dream about. As we know those dreams did come true for both, albeit in slightly different ways. In the winter of 1948 there’s little question that Pomus was the most unlikely singer in rock, or perhaps any field for that matter. Aside from the fact he was the only white performer in what was still an entirely black idiom, not to mention the only Jew as well as the only performer with a prominent disability, he was still suffering from the malady that tends to separate ALL hopeful stars with those who eventually will become a star – that of his enthusiasm far outstripping his ability. Now for most artists that’s going to be true when they’re first starting out. Michael Jackson aside, there aren’t many kids who want to be rock stars who have what it takes before hitting puberty, but that doesn’t stop them from throwing themselves into it with all they’ve got when they’re singing in the shower or imagining themselves on stage while bouncing around their empty house blaring away with the radio after school. But it’s one thing to be heavy on enthusiasm and light on actual talent when you’re a mere tyke, but when you’re twenty-two years old, as Pomus was now, there had better be a narrowing gap between those two entities. Thus far there was little sign of that. He was still an enthusiastic amateur when it came to singing, with a voice unable to come close to matching his idols like Big Joe Turner (though truthfully, even great singers who were professionals for years had trouble reaching the bar set by Turner). If anything his lack of inhibitions regarding that shortcoming made him endearing to the audiences he did get to perform for and combined with his even more visible impediments to success in this realm – everything from skin tone and lack of looks to the afflictions brought upon by his bout with polio – it made him a loveable underdog in the club scene. But being a loveable underdog is not the path to success, at least a lasting success where it’s your talents that are appreciated rather than your spirit and determination at overcoming long odds stacked against you. There was only so far that a sense of pity from your audience was going to take you in the world and like it or not, and as cruel as it is to contemplate, pity was about all he seemed to have going for him at the time. 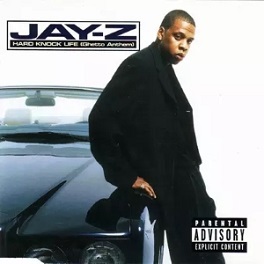 Another section, another line from Jay-Z’s Hard Knock Life as its heading. Just so I don’t have to KEEP pointing this out to those in the audience who’ve let the last three decades of rock float by like a wispy cloud on a sunny day, all of the section headings are taken from the lyrics of that song and yes, they are all relevant to the story of Doc Pomus in 1948 in case you were also wondering that. Now it was obvious to anyone with an ear that the one thing Pomus had going for him certainly wasn’t his voice, but rather what his voice conveyed, namely the lyrics he’d written. At this point his lyrics were still rather simplistic, showing little of the depth, the sensitivity or the nuance he’d later become famous for, but they ARE noteworthy in that he’s already able to pinpoint the topics that rock will thrive on. Considering he cut these songs in November when rock was just two months old, it shows that if nothing else he instinctively had his finger on the pulse of the music and, maybe oddly enough considering his own background, the mindset of the community rock was aiming at as well. Or maybe that’s not so odd when you take his own hard knock life into account. Though the particulars may be different on the surface, discrimination is discrimination and the feelings it engenders and the determination to celebrate life in spite of it shine through all the same. Doc’s Boogie, crude as it may be, exemplifies this. Though a series of broad clichés that don’t show much insight at first glance the spirit of overcoming every bump in life’s road was never more joyfully expressed, at least to date, than shown here. It’s about as straightforward as it gets and hardly showing any flair for inventive wordplay, but rousing anthems for living life to the fullest rarely are very deep. Instead they’re conveyed with unrelenting enthusiasm and the words need only be on target with their sentiments – as these are – not probing for deeper meaning. That doesn’t mean Doc’s Boogie is a great song however, but it IS reasonably effective for what it wants to project and for once is aided immeasurably by a clear vision from all involved. Pomus’s lack of vocal skill requires him to lean heavily on the music’s arrangement which is where he’s pulled up considerably. The whole track never lets up and unlike a good many early rock records where there’s a visible conflict between the writer and the band or the producer and the singer, here they’re all in stride throughout and intent on reaching the same goal. Because the band’s enthusiasm matches Pomus’s you don’t spend your time focusing on the individual weaknesses quite as much as you would if they weren’t on the same page. Doc doesn’t sound nearly as underpowered when they’re churning beneath him at full throttle and the band’s missteps in how to best highlight this infectious spirit wind up getting steamrolled by his insistence on pressing the gas pedal to the floor. But since this is a review of the record as opposed to the party atmosphere they’re suggesting we’d be remiss if we didn’t at least touch upon the highs and lows, the latter of which not surprisingly focuses on the trumpet heading up the brass section and coming off just a little too jazzy. It’s not too complex in any way, just not gutsy enough to convince you of the urgency of it all. This may be dismissible during the opening with them all playing together but it’s less so during the break when they each get their chance to stand alone. The two tenor sax solos from Jesse Powell and Ray Abrams are very good but they’re sandwiching Bill Moore’s trumpet solo which is the weakest aspect of the record. This is not his fault maybe, he’s not hitting the wrong notes or anything, but trumpets simply aren’t designed to rock out the way this calls for and as a result that passage can’t help but drag it down some. Luckily the piano has no such problems as Reggie Ashby keeps up a steady pace on the treble keys, while his left hand provides the most prominent rhythm aspect of the record, bolstered slightly by the drums, though had they emphasized this more it would’ve certainly helped. Throughout it all though Pomus seems blissfully unaware of any of these issues, or of his own notable deficiencies as a singer. Coming out of the break he ramps up his excitement accordingly until he’s nearly out of breath, selling this with everything he’s got, trying to convince you, and maybe even himself, that if you close your eyes he’ll become Joe Turner after all and you’ll all be having as much of a good time as he’s having in his own mind. You’re not of course. Effort alone can’t transform subpar singers and a well-meaning band still constricted by the mindsets of the preceding era into something sleek and modern and at the forefront of the newest musical revelation. But Doc’s Boogie IS much better than the top side even as it’s hampered by many of the same faults. It’s a harmless record that in the right setting with everybody already half in the bag would go over just fine. 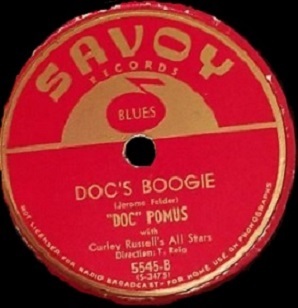 But in spite of that nobody hearing this in 1948 would have any reason to think the name Doc Pomus would be spoken aloud – and with any reverence – by rock fans come 1949, let alone 1959 by which time Pomus had re-emerged as one of the most gifted songwriters of his era. By then he’d given up his dreams of performing and his generally weak endeavors in that realm would be a mere curiosity in later years for those digging deeper into his life’s story. Even with a string of writing successes over the next decade it was still a hard knock life for Doc but one he traversed with grace and wit and if nothing else it was his stillborn singing career that led to those later triumphs as a songwriter and so, for no other reason than that, this is hardly a wasted effort in the big scheme of things. What’s so great about rock ‘n’ roll is that in one review we can drop the names Big Joe Turner, Michael Jackson, Jay-Z and Doc Pomus and they all somehow are compatible, not just musically as major players in rock’s evolution but as figures who emerged from different eras and backgrounds yet shared many of the same aspects of their hard knock lives and still climbed to the top in spite of it all. Life itself can be a struggle at times and when trying to conquer a world where everything seems stacked against you – and doing it in the public eye no less – only makes your failures sting all the more. Once you’re respected there’s no shortage of those who will pat you on the back and congratulate you for your past victories over these obstacles, but until you reach the top there’s no love lost for the ones clawing their way towards respectability. They all did that and then some, which as basic as the prescription seems is really what rock’s about in any era. Leave a reply on "Doc Pomus: “Doc’s Boogie”"